You selected your photographer, set the date and now you’re wondering how to dress for your Philadelphia outdoor photo session. Read on for three simple clothing tips for your upcoming photo session. 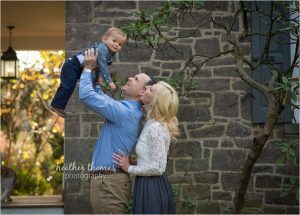 Do you know the number one reason why families put off their family photo session? Wardrobe. I hear it all the time. Parents are skipping family photos simply because they don’t know where to start with clothing. Many have a lot of ideas, visuals and even clothing in hand, however, they often need help finalizing or piecing it all together. 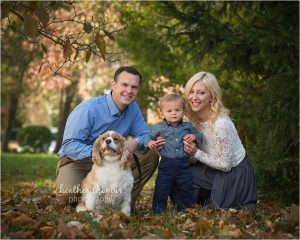 This brief article will lay out 3 very simple clothing tips to bring your family portrait from BLAH to BAM! What is the backdrop of the photo session? A local park or field? Or perhaps a more urban or structural backdrop? What is the style/color of your home? What is the personality of your family? If you’re aiming to capture the laidback personality of your family, it wouldn’t make sense to go with formal attire for your little ones. It can help to start with one “rock star” outfit that you love on a member of your family then pull more simple outfits in for the rest of the groups clothing or accessories. Let’s say you found a dress that you love on yourself. Is it a solid color or does it have a soft pattern? 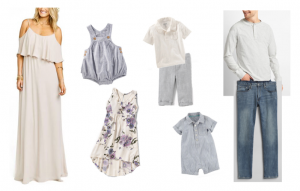 If your dress is blue or has blue tones, let’s complement it with ivory, gray or soft pinks. Use a couple of the colors in the first outfit and tie in the rest of the set. You can do this with a neutral tone and add more color or try a softer palette that has different tonal ranges of the same shade. Pick out one of the tones in another person’s outfit and choose an accessory such as a statement necklace to complement. Keep it simple. One spot pattern is plenty. Adding layers and textures add depth to your photographs. By this, I mean different clothing materials and accents – lace, crochet, corduroy, hand knit items, lightweight skirts, leggings, ruffles etc. To add layers to your clothing, think scarves (lightweight or winter weight), hats, jackets, blazers, ties, denim, knits. Think leggings under skirts/dresses, blazer over a button down. Fun shoes like tall boots or sassy heels for the colder seasons. A variety of textures will give your photos some extra punch to go with your great smile. Follow your own vision and style! Leave Elmo and Daniel Tiger at home. Keep it timeless and focused on your faces, not the characters. Character-wear and logos may be fun in person but will leave you clueless in twenty years. The focus of your family photos should be on you as a family. Characters and bold bright patterns distract the eye making it difficult to really focus on the relationship and joy your family shares. Tiny logos on the corner of a polo shirt are fine. Bigger branded logos are distracting and not necessary to include in your family portrait. In conclusion, start with a simple color palette that works well with the style of your home and the backdrop of your photo session. Then begin selecting one outfit that you love on yourself or another member of your family. Work the rest of the outfits off of those tones. Browse Pinterest or clothing websites to get inspired. Lay out your outfits and send a photo of them to your photographer for the second set of eyes. I hope this article helped you figure out how to dress for your Philadelphia outdoor photo session. Don’t forget to have fun and enjoy the process – these are photographs you will be enjoying for decades to come!